P510S Event Photo Printers - ACE Peripherals ::: Completing I.T. 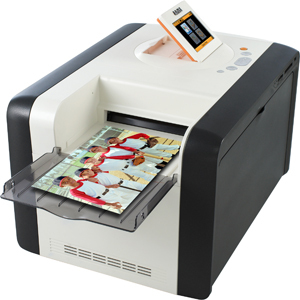 HiTi P510S photo printer re-defines "Instant Photo Printing" by giving photographers a light-weighted roll-type dye-sublimation Digital MobileStudio. Designed as an easily movable roll-type printer and weighing only 13.6kg, the P510S brings the flexibility to do on-location photo finishing. The front loading design of the HiTi P510S printer allows for easy access to the ribbon and paper roll resulting in easy and efficient maintenance procedures. HiTi continuously makes efforts in developing the all-new Studio-on-the-go product with easy-carry appeal, allowing customers to bring their photo business anywhere. Utilizing a graphic user interface on a 3.6-inch LCD, it is very easy to operate HiTi P510S printer without the need of a computer. With less clicks and intuitive user-interface design, printing a photo can be a much easier and faster experience. P510S provides varied professional image software for all your business needs, making good use of passport/ID photos and e-frame photo printing.